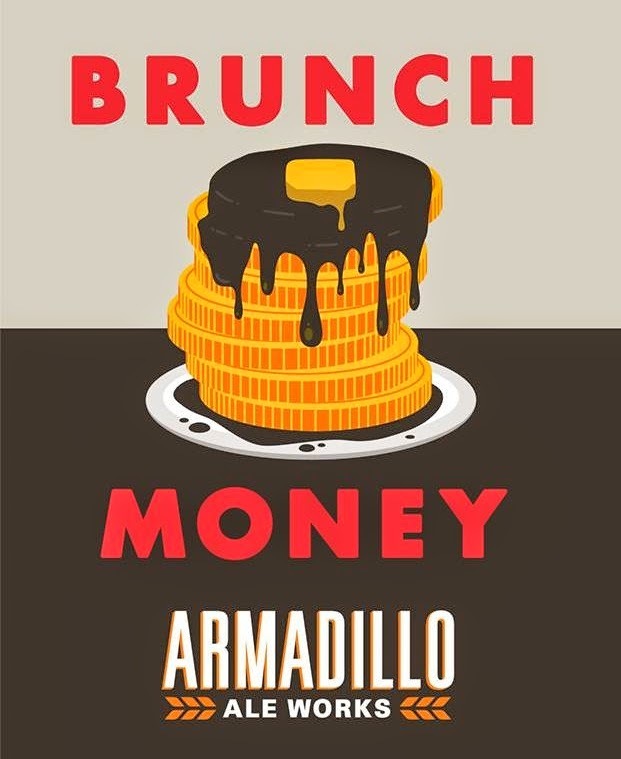 If you've had a chance to try Brunch Money, the latest release from Armadillo Ale Works being billed as an imperial golden stout, you might be asking a question that's on the minds of many. How can a stout be gold? The "art and science of brewing" has a lot to do with it, according to co-founders Bobby Mullins and Yianni Arestis. At least, that's how they responded to a follower who posed that very question after plans for the beer were revealed in early March. Still, any artist has to have a palette, and in this case it took the form of a "crazy recipe" consisting of no fewer than thirteen ingredients. To get the taste of a stout, golden or otherwise, you have to consider that these types of beers typically employ dark specialty malts to achieve flavor profiles rich in roasted grain and dark chocolate. Naturally, similar flavors can also be obtained in beer by using varying amounts of coffee and cacao nibs, but like the aforementioned malt varieties, these items don't exactly fall into the lighter side of the color spectrum. Here's where that art and science thing kicks in. Getting the desired flavors minus the color involves a cold-brew process where cracked coffee beans and cacao nibs are steeped in the beer for a set period of time. How long you choose to "dry-hop" the beer in this manner becomes a trade-off between how much flavor you wish to impart versus how much color gets infused in the beer. Of course, brewing a stout isn't just about flavor. Beers in this style category are also generally full-bodied and of greater strength. A closer look at Brunch Money's recipe reveals how Mullins, Armadillo's Chief Brewing Officer, went about obtaining these remaining characteristics of the style. Like Quakertown Stout, one of Armadillo's two year-round offerings, Brunch Money contains maple syrup. Its presence contributes additional fermentable sugars to the wort, which provides extra food for the yeast. After conversion, this translates to a higher alcohol concentration in the beer. As for body and mouthfeel, getting the beer to drink like a stout involves the addition of flaked barley and oats in the grain bill. Flaked barley leaves behind proteins which provide some of a stout's trademark heft, while also helping to sustain head retention. Oats, on the other hand, are used in a variety of dark beers to lend creaminess or a silky texture. So, does it work? Has Armadillo legitimately created a golden "stout"? While Brunch Money isn't exactly golden (it's more of a ruddy amber), it's certainly paler than an ordinary stout, and it hits on fundamental flavors in being coffee-forward with a noticeable dark chocolate element. Beyond that, further additives give off notes of caramel, vanilla, Coffee-mate, honey and maple syrup. In terms of mouthfeel, the beer has a medium-full body, and finishes smooth with what you might call a teasing bitterness. Were I to drink it blind, I'd probably classify Brunch Money as a flavored coffee stout. It's a good, well-executed beer that Arestis described best when he said it "sounds overwhelming and intense, but is surprisingly balanced and nuanced." It's in that statement where I think this beer stands out. Think about how some breweries struggle to make a good beer with even one specialty ingredient (that is, anything other than water, malt, hops and yeast). Counting coffee beans, cacao nibs, lactose sugar, maple syrup and vanilla...Brunch Money is a good beer with five. Look for Brunch Money on tap for a limited time only. A bottle release is being considered, but a decision on that has yet to be finalized.